Friday February 25 1910 Will had men helping him put hay in the barn I wrote some cards and a letter in the forenoon and got the dinner. I wrote another letter in the afternoon and was in bed about three hours. [Frankie Pointain?] was up to see me. knit in the evening. 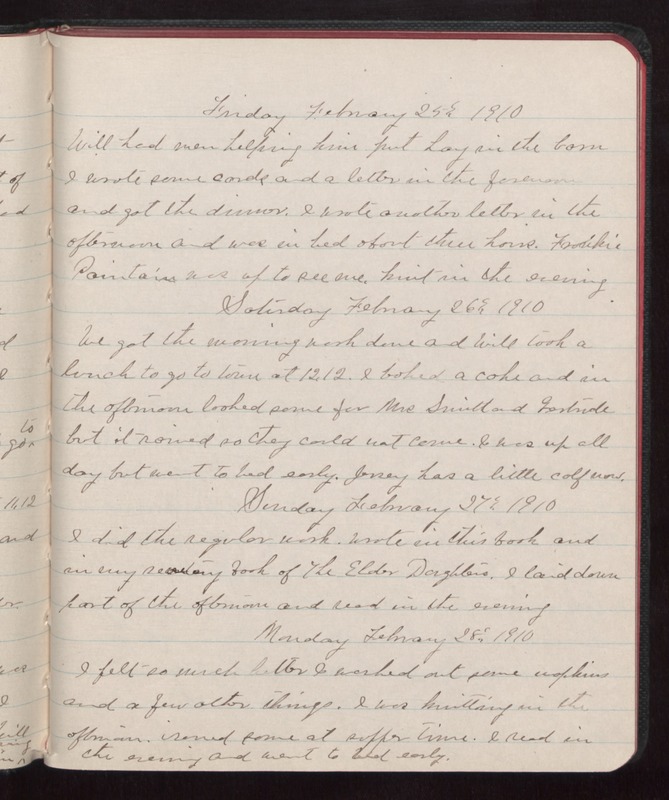 Saturday February 26 1910 We got the morning wash done and Will took a lunch to go to town at 12.12. I baked a cake and in the afternoon looked some for Mrs Smith and Gertrude but it rained so they could not come. I was up all day but went to bed early. Jersey has a little calf now. Sunday February 27 1910 I did the regular work. Wrote in this book and in my secretary book of The Elder Daughters. I laid down part of the afternoon and read in the evening Monday February 28 1910 I felt so much better I washed out some napkins and a few other things. I was knitting in the afternoon. sewed some at supper time. I read in the evening and went to bed early.